Every year, hundreds of confused students enter your school for the first time. Anxiety is high as they try to navigate the school campus in search of classrooms, admin offices, restrooms, and food. Digital signage can take some of this anxiety away by displaying a wayfinder map of your school. Learn how to make a school map in this post. 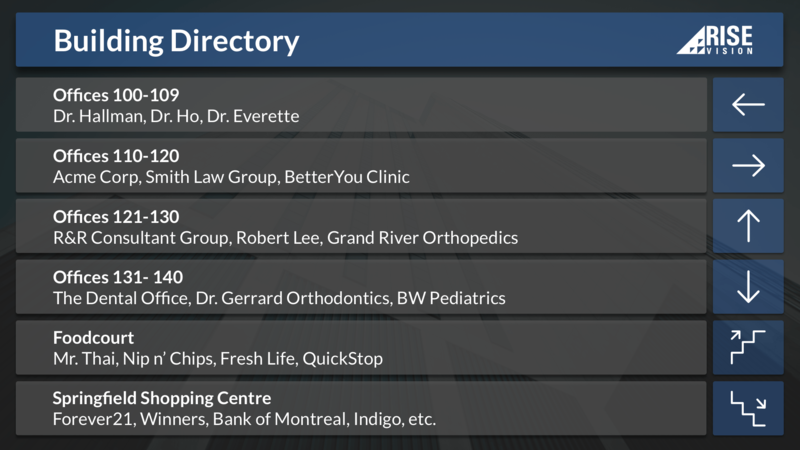 While some schools display a map of their entire campus, many schools have taken a more simplified approach, such as the digital building directory example below. In this template example, students and visiting parents can quickly and visually see exactly where they need to go with easy to follow directional arrows. An easy to read icon also shows if something is upstairs or downstairs, which is ideal for a large university hall wayfinder map where there are dozens of classrooms spread across several floors. 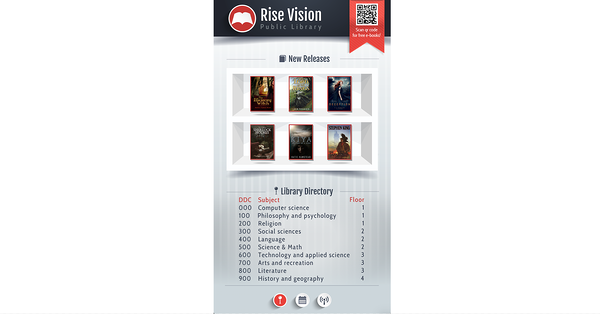 The above example is part of the template library available to Rise Vision users. The editable template can be fully customized to match a school’s branding and colors. You can see how templates work in this post or watch the video below. While wayfinder maps are one of the most popular directional digital signage templates, many school libraries use the template below to help students and faculty find books and other resources in the campus library. 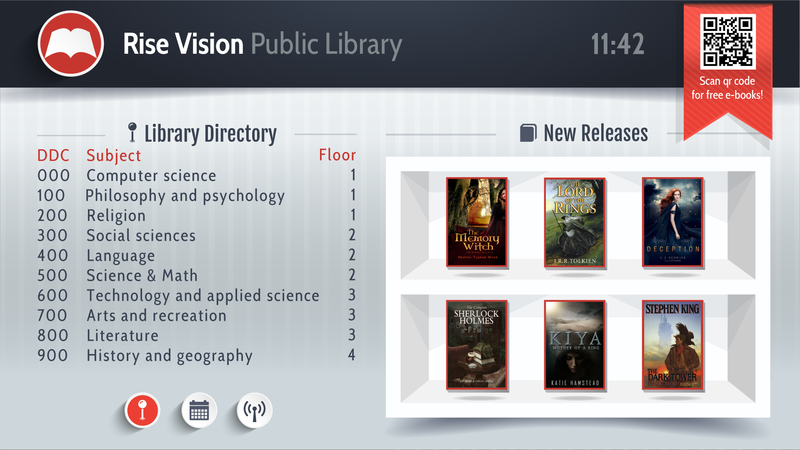 In addition to display where books are located, the above example also promotes new titles in the libraries collection. Like all templates, it can be completely customized and elements / images can be added and removed with little effort. While the wayfinder maps above are great for buildings, most schools also want to use digital signage to display a larger map of their entire campus. There are several ways users do this, but the most common is to upload images of the maps--some even use Google Docs to display their map. The image below shows how the College of Lake County added a larger campus map to their digital signage. One school directory best practice is to highlight the building the map is located in, as College of Lake County did in the above example; this helps students and school visitors quickly see where they are on the map in relation to where they want to go. The college also uses a red “YOU ARE HERE” pin. Because Rise Vision is open source and supports multiple platforms (Windows, Linux, Raspberry Pi, and Chrome) users are free to use whatever method that they prefer. School digital signage maps are one of the many ways schools are using digital signage. You can read about the best practices schools take with their digital signage here; or read over 50 ideas for school digital signage here.